Jerry Blumenthal, founding partner of the Chicago documentary production house Kartemquin Films, passed away on Thursday. He had been involved with the company from the production of its first film, Home for Life, in 1966. Over the next four decades he would codirect almost a dozen projects for Kartemquin—among them The Chicago Maternity Center Story (1976), The Last Pullman Car (1983), and Golub (1988)—and serve as editor, sound recordist, or consultant on numerous others. He also worked on Barbara Kopple's Oscar-winning documentary feature American Dream (1990), in addition to teaching courses at the University of Chicago and Columbia College. "He was a friend, colleague, and mentor to so many of us," reads a statement on the Kartemquin website. "All of us in the Kartemquin community are mourning his loss, and will be for many days to come." Blumenthal had been interested in film since his undergraduate years at the University of Chicago, where he discovered world cinema by attending screenings at Doc Films. His academic focus, though, was in English literature and philosophy. After earning his bachelor's degree in the early 1960s, he began teaching humanities courses at city colleges, and it was at this time he discovered how cinema could serve as an educational tool. Teaching film studies courses "would allow me to connect with students and watch a lot of films myself," Blumenthal said in a career-spanning 2008 conversation (which can be found on the Kartemquin website). "It was a great way to reach students, because film is so immediate." He then enrolled in a PhD program in film studies at Northwestern University. As part of the program, he made his first documentary, Shulie, a short about radical feminist Shulamith Firestone while she was a student at the School of the Art Institute. In making that piece, Blumenthal "really fell in love with filmmaking," said longtime friend and associate Judy Hoffman. "There wasn't much filmmaking going on at Chicago at the time, other than the beginnings of Kartemquin Films. He went over to [Kartemquin founders Peter Karter, Jerry Tamener, and Gordon Quinn] to show them Shulie, and they started to work together. He was a filmmaker ever since." For the next two decades, Blumenthal would divide his time between political documentaries and television commercials. By "taking on paying work in the film business that wasn't totally obnoxious, distasteful, and politically disgusting, [I could] make enough money that we wouldn't have to go begging for grants to get [Kartemquin] projects off the ground," he said in 2008, noting that he also learned a lot from working on commercials. "They sharpen your skills as a filmmaker, enable you to explore ways of using the rhetoric of cinema persuasively." Many of the films that Blumenthal codirected addressed social issues, such as union organizing and public housing, though he maintained a lifelong interest in fine art. "Jerry was always interested in how art could impact life, politics especially," said Hoffman. 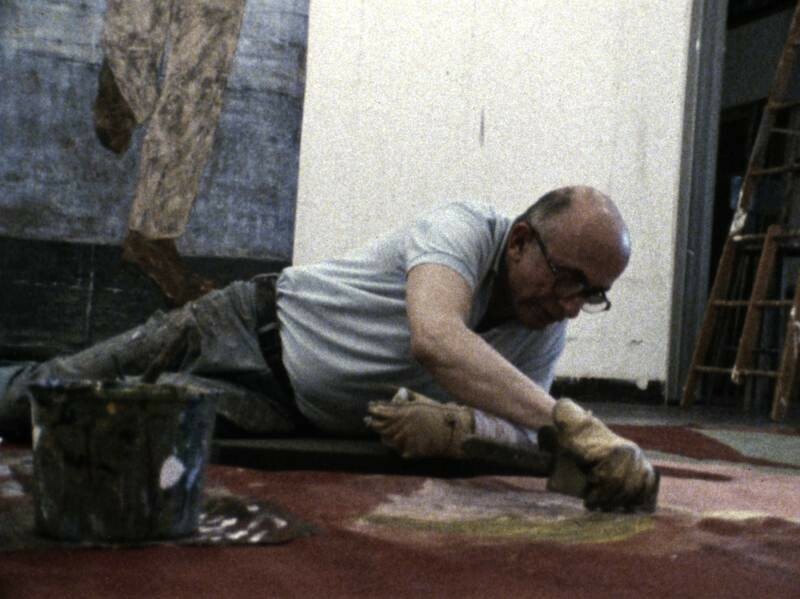 Not surprisingly Blumenthal's favorite of his own films was Golub, which presents the creation and public reception of a large canvas by painter Leon Golub on the subject of the U.S. government's involvement in El Salvador. Jonathan Rosenbaum, writing in the Reader, declared it "probably not only Kartemquin's best film, but also the best account of the creation of a work of art." Blumenthal was particularly proud of how the film fused his two primary interests, describing Golub as "a film without any kind of shame or embarrassment in [being] artistic. That kind of creative and artistic shaping of the material was very much a part of its political subject." In the last two years Blumenthal was at work on two other artist documentaries. The first is Murder the Prepositions, which he returned to in 2013 after setting it aside in the mid-1990s, concerned poet Les Bridges's struggle with aphasia, which affects our ability to formulate or comprehend words. The other was a short about political artist Gerda Bernstein, which until recently Blumenthal was working on with producer Adam Singer. According to Kartemquin executive director Justine Nagan, he was at the production house less than two months ago to consult with Singer on the editing. "We chatted at the editing station, which is a great way to remember him," Nagan said. "He was always great to joke around with and to get into these intense conversations about film, whether it was on style or ethics." Blumenthal especially loved conversing with students. Besides teaching college courses, he served as a mentor to many aspiring filmmakers who passed through the Karteqmuin office. (He also volunteered with at-risk youth.) The conversation posted on Kartemquin's website finds Blumenthal offering advice to the organization's then-current batch of interns. In the recording, he responds to each question at length and fleshes out his responses with personal reminiscences. He speaks of himself as a lifelong student, admitting that he can improve in his work. "In pretty much all the films [Kartemquin has] been doing lately, the same thing has come up: There are new challenges, new stories to tell, and you have to reinvent yourself as a filmmaker in order to tell them," he says. The conversation also reflects Blumenthal's optimism about the organization's future. "[Quinn and I] are working on the issue of sustainability, so the mantle can be passed to other people to keep the organization going after we're gone. Although there's been a lot of change, there's still that desire to keep [Kartemquin] the same in the core respects, in terms of the kinds of stories we want to tell and where we see politics." The shorts program "Kartemquin Members' Work for Hire" kicks off a monthlong series of eye-opening discoveries from the annals of educational filmmaking.